Iran is a country with over 25 centuries of history. The sources of the law and the judicial system of this country have undergone many evolutions and submitted to numerous influences. These influences have been ethnic, religious and legal. Sometimes they were imposed on the Persian governments, other times they were voluntarily accepted. They could have been the result of wars. Since the 7th century, many things have changed in Iran, except for one thing : the concept of Shi'ah Islamic law being the foundation of the Iranian legal system has not changed up to the present time. The Shias and Sunnis are the two main branches of Islam. Schism between appeared after the Prophet's death in 655. The Sunnis considered that the followers of the Prophet were to elect his successor upon his death, whereas the Shias considered that the prophet's successor was Ali, the Prophet's nephew and son-in-law. Shias believe that the Prophet designated Ali as his successor before his death, during his last pilgrimage at Mecca. Ali and his eleven descendants are therefore called Imams (Guides) and the Shias Muslims consider them as the most important figures of the Islamic religion after the Prophet, their sayings having almost the same value as those of the Koran and the jurisprudence of the Prophet. The Sunnis designated “Caliphs” as the Prophet's successors. Caliphs usually governed the Islamic territory and exercised tyrannical power on the population. Eventually, all of the Prophet's descendants were killed directly or indirectly by the caliphs, mostly because of their popularity. There philosophical, legal and political consequences arising between these differences. Philosophical: The Shias philosophy is based on the existence of the free will as part of the determination of man's destiny in this world, whereas the Sunnies believe in the principle of predetermination (the concept of “mektoub” : man's destiny is “pre-written”). This essential difference resulted in greater freedom of speech and spirituality among Shias during the Arab invasion. Legal: The consensus of historical communities, not the decisions of political authorities, led to the establishment of four legal schools of thought : Malikis, Hanafis, Shafi'is, and Hanbalis. In theory, a Sunni Muslim could choose whichever school of Islamic thought he or she wished to follow and could change this choice at will. The Shia Muslims have only one legal school. The main difference between the Shia and the Sunni schools, among many others, is the difference in the sources of laws: whereas the Sunni and the Shia Muslims agree on the existence of the four main sources of Islamic law, i.e. the Koran, the Prophet's tradition and jurisprudence (referred to as the Sunna), the “consensus” which consists of the universal and infallible agreement of the Muslim community, especially of scholars on any Islamic principle, at any time (Ijma'), and the reasoning (Aql), Shia Muslims add to these sources the traditions and jurisprudence of the Imams (the prophet's descendants). Therefore, the interpretation of the same documents or concepts result in conflicts between Sunni and Shia laws. Political: throughout their history, Iranians used Shia as a means of resistance against the Arab Invaders by proclaiming the right to a new and different way of interpreting the Islamic concepts. It should be kept in mind that less than 10% of the over 1 billion Muslim population in the world is Shia. Therefore, taking into account the fact that the population of Iran is approximately 69 million people according to the most recent statistics, and more than 88% of this population is Shia, this means that more than 65% of the Shia population of the world lives in Iran. Other Shia Muslims live in Afghanistan, Irak, Turkey, Russia, India and, of course, many other countries. 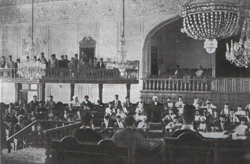 The Iranian Parliament in 1906.
than the mollahs (wearing turbans). As long as the judicial system is concerned, too small were the changes until the end of the nineteenth century. The judicial power has always been concentrated in the hands of the clergy which was considered as the legitimate source rendering justice : The law is considered as being based on Islamic sources and the clergy deemed as the legitimate authority for interpreting the Islamic sources. Although in the early uncertain days of his career, he showed that he knew how to play upon the religious emotions of the people, Reza Khan was basically apathetic to religion and antagonistic toward the clergy. That is why nowhere is the impact of the Western civilisation upon the institutions of Muslim Iran more apparent than in the reforms of the judicial system. 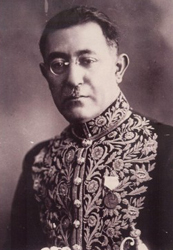 He started the reforms as soon as he became Prime Minister.The adverse consequences of World War I on Persia's economical situation as well as the extreme weakness of the central government which favoured the return of the local landlords had destructed the infrastructures of the political system and the government at the end of the Qadjar Dynasty. Therefore, Reza Shah proceeded as quickly as possible with his plans for reform. He founded a new corps of civil servants taking into account the western model and also the foundations of a new judicial system. His principal objective was to abolish the system of Capitulations. The concept of capitulations in Iran goes back to 1910 when the Russian government signed a treaty with Persia according to which the Russian citizens received immunity from Persian courts in the event they committed crimes on the Persian territory. This provision was imposed on the Persian government by the Russian government because of the lack of impartial court judicial system guaranteeing the fundamental rights of the accused individuals.Therefore, the Russian citizens could commit any crime without being prosecuted in Persia and they were also protected by their own courts as long as such crimes did not attain the interest of their own country. This problem became progressively a general problem as the Persian government was forced to confer such immunity to citizens of other countries on the basis of the treaties that they had signed with it : such treaties usually contained a clause called “most favoured nation”. In 1925, the citizens of more than thirty countries disposed of such privilege through their respective treaties ! But Reza Shah was extremely sensitive to foreign criticism, and he realised that so long as Iran did not have a judicial system along Western lines, the abolition of Capitulations might attract adverse publicity in Europe. He knew also that in order to be credible when abolishing the Capitulations, he should give real efficiency to the Persian judicial system, and most of all to the criminal courts. The man who carried the weight of this responsibility was Ali Akbar Davar, the Minister of Justice, who was one of the young chief lieutenants of Reza Shah in his efforts to westernise the country. This young man was of middle-class origin. He graduated in Law at the University of Geneva and was the chief member of the so-called “brain trust” of the Reza Shah regime. Thanks to its legal education received in Switzerland, Davar decided that the first step towards the acquisition of the wanted efficiency was codification. This decision was a very important one which impacted the future evolution of the Persian legal system : Davar chose to give the Persian system a continental European structure, thus distinguishing it from the Anglo-Saxon system. The Persian law, which consisted of small pieces of legislation until then, became therefore more and more complex. Experimental commercial and criminal codes were introduced in 1924 and 1926. Early in 1927, the old Ministry of Justice was dissolved and in the spring of the same year, new personnel, many of whom had received European education, took over the administration of the new Ministry of Justice from the former clerical officials. This new Ministry of Justice was charged with the preparation of Codes of law. 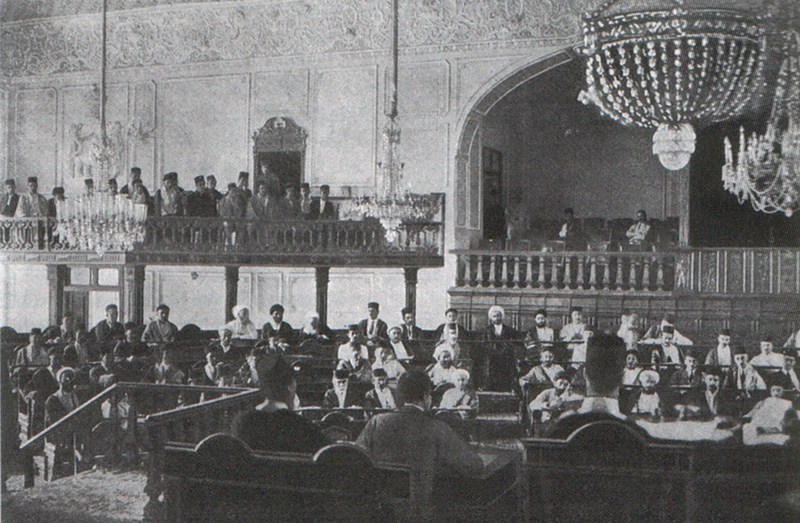 Early in 1928, a commission within the newly formed Ministry of Justice, headed by Davar, presented to the Majlis the first volume of the Civil Code; as well as a judicial reorganisation bill establishing a hierarchy of courts. On May 8th, 1928, the Code was approved. As the government was anxious to get over with the Capitulations, under Reza Shah's instruction, little opportunity was given to the members of the Parliament for debate. In the parts dealing with general subjects, it was a verbatim translation of the Civil code of France. One other objective was sought : as this code was a secularisation of the Shari'ah, Davar knew that the members of the clergy could be of adverse effect on its accomplishment. Therefore, little communication was made about this Code and the first volume was voted before any opposition could be heard. This led to the approval of the second volume of the Civil Code in 1935. To those who opposed the Code after it was approved, Davar would say that these codes were experimental and temporary. Once the codes were prepared and enacted, Davar knew also that qualified personnel must be trained as quickly as possible to be able to apply this new legislation. Among this personnel, the most important ones were the judges. He was also hoping that the formation of a new civil corps of judges will help the government combat the ongoing corruption. A special effort was therefore made to train the new judges in the University of Tehran. The faculty of law of that University trained new students, whereas evening courses were organised for judges in exercise which could be acquainted with the new legislation through a continuing formation. Judges educated through this new systems were not so many in the early days and the formation of the Persian Courts based on the new system took several years before it came actually efficient. Judges were sent to the capital cities of different provinces when their education was complete. As regards the organisation of the courts, the burden of this reform was on the shoulders of a few honest and qualified judges that had the knowledge of the old and new systems and who could successfully ensure the transition between the two. One could cite, among many others, Mohammad Shafie Jahanshahi, Mohammad Reza Vejdani, Mehdi Gholi Hedayat, Nur Ali Elahi, Seyed Mohammad Fatemi Ghomi, Assadollah Mamaghani, Habibollah Shobeyr and Javad Ameri. One can understand that the new legislation and court system needed time to be efficient. It must however be understood that without these judges and their efforts in implementing the new laws in Iranian provinces very far from the capital city, never modernization could have resisted the obstacles created by the clergy and the feudal organisation of the Iranian society. But Reza Shah had only two ideas in mind : abolishing the capitulations as quickly as possible and continuing the reforms. Therefore, based upon the reforms made in the Persian judicial system by Davar, the Government denounced all capitulation treaties in the year 1928. In effect, the vital blow to the position of the clergy in the judiciary system had been dealt on March 17, 1932, when the Majlis enacted a law concerning the registration of documents and property. It required that the registration of legal documents, of ownership, and of other transactions concerning immovable property be carried out in secular state authorities only. This function had previously been the monopoly of the Shari'ah authorities and, together with the registration of marriages and divorces, had been the most important function of those authorities. Furthermore, it was by far the largest source of revenue for the mujtahids and lower clergy. As a consequence of this law, many members of the clergy were forced to abandon the robe and seek secular employment. Legislation completing the permanent secularisation and Westernization of the judiciary system was enacted on December 27, 1936, when a law concerning the reorganisation of the judiciary system and the employment of judges was passed by the entire body of the Majlis. In setting the employment qualifications for judges, it eliminated many members of the clergy from the judiciary. It was clear from the beginning of the Reza Shah's reforms that the clergy members would have to be removed from the judiciary system. But there is reason to believe that the final step taken in 1936 was primarily motivated by a desire to hasten that separation, and not by a consideration of the needs of the new system, and the effects that such legislation would have. Yet it was inevitable that since the judiciary system had been so greatly expanded, the sudden exclusion of a large proportion of former practitioners should have adverse results. A real crisis arose in the judiciary system, as there were not enough educated and qualified personnel to fill the new and vast organisation. It was very frequent for a judge to go from one mission to another, from one province to another in the course of one or two years. One judge could also be entrusted with a mission for several provinces : these courts were called travelling courts. The new and final version of the Civil Code passed in 1939 gave greater jurisdiction to lower courts, increased the powers of the state attorneys and prosecutors. It also provided, for the first time, special procedure for the trial of foreign nationals. Both the Civil Code and the Penal Code reflect the influence of Western judiciary models. Like the civil and penal Codes, the organisation of the courts in Iran followed the French pattern. This large influence of the French and European legal and judicial systems on the Persian system was mostly the consequence of the employment by the Iranian government of various European professors of law and legal advisors to the Ministry of Justice during the regime of Reza Shah. 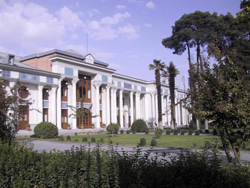 From 1922 until 1939, eight French and two Italian professors were engaged to teach at the Faculty of Tehran for a total of sixteen academic years. Therefore, for nearly ten years after the rise of Reza Shah, the power of the clergy was diminished by a process of attrition. This process led finally to a general law enacted by the Majlis on November 30th, 1931, which totally redefined the status and jurisdiction of the shari'ah courts. The shari'ah courts were forbidden from pronouncing sentence. Their verdicts were to be sent to the state court that had referred the case to them, to be pronounced by that court. In case of appeal by the defendant, the verdict of the shari'ah court could be reviewed by the state court. 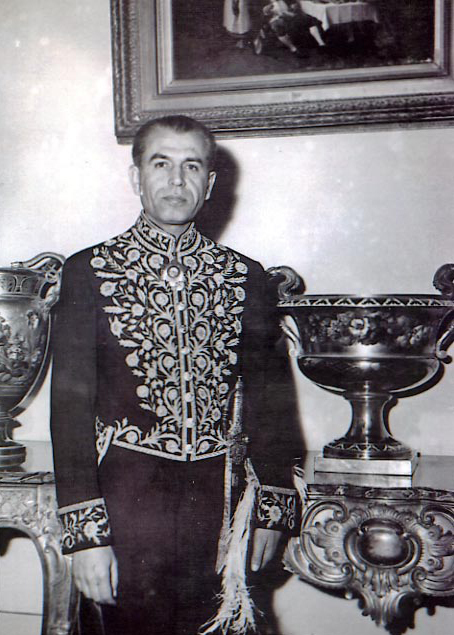 Reforms were followed under Mohammad Reza Shah's reign (1941-1979) but not with the same force. The most important efforts were made in the fields of women's rights and family law. In any event, the process of attrition of the powers of clergy conducted under Reza Shah must be directly linked with the political events that happened some 40 years later in Iran in 1979.